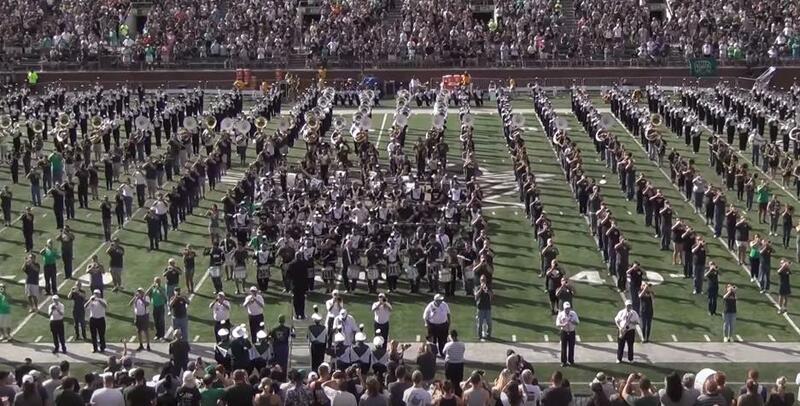 The Ohio University Marching 110 celebrated 50 years of tradition and greatness during their homecoming game this season. The weekend was one for the ages and their mega band performance is one that they will remember for a long time. Over 1000 current and former members marched in the parade and/or at halftime of the game creating a fantastic show. If there is anything in this world that can unite both die hard football fans and band fans it is an alumni band. Everyone loves alumni band. Included in the band were former directors, Mr. Gene "Coach" Thrailkill founded the Marching Men of Ohio in 1967 and directed until 1970 before moving to Oklahoma for a ~30 year tenure with the Pride of Oklahoma. The family of the late Ronald P. Socciarelli were present, alongside Dr. Sylvester Young, who previously directed at Hampton and is currently on faculty at his alma mater, Florida A&M. As you watch the performance you will notice some members on the sideline wearing white polos. Those are some of the living members of the 1967 Marching 110, the first members of the modern band era. What a special day for the Marching 110 band family. Congrats on 50 amazing years!